As the pace of innovation accelerates, engineers around the world are tasked with designing, managing, and optimizing increasingly complex systems. Employing industry case studies and the latest in systems thinking from MIT, this four-course online certificate program explores models and methods in systems engineering. You will analyze complex systems and gain a knowledge base in model management in complex systems, and model management that will impact how you approach and solve problems and keep abreast of innovation. By the end of the program, you'll be able to frame systems architecture as a series of decisions, which can be actively sorted, managed, and optimized to suit you and your organization's needs. To earn a Professional Certificate, you must complete the four courses in the program. For those who do not want to commit to the full program, courses can be taken on an individual basis. Are you a Boeing employee? This certificate is offered off-hours and funded through The Boeing Learning Together Program. Understand complex systems, analysis of complex systems, and model management. Frame systems architecture as a series of decisions which can be actively sorted, managed, and optimized to suit your organization’s needs. Articulate the benefits and challenges of Model-Based Systems Engineering. Develop a comprehensive knowledge of the key aspects of systems engineering. Learn from academic and industry leaders. Bruce Cameron is the Director of the System Architecture Lab at MIT, and a co-founder of Technology Strategy Partners (TSP), a boutique consulting firm. His research interests at MIT include technology strategy, system architecture, and the management of product platforms. Dr. Cameron has directed research projects for BP, Sikorsky, Nokia, Caterpillar, NSTAR, AMGEN, Verizon, NASA, and ESA. Prior to MIT, Dr. Cameron worked as an engagement manager at a management consultancy and as a system engineer at MDA Space Systems, and has built hardware currently in orbit. Dr. Cameron received his undergraduate degree from the University of Toronto, and graduate degrees from MIT. Dr. Hoburg has been a member of the MIT faculty since 2014, after earning a B.S. in Aerospace Engineering from MIT and a Ph.D. in Electrical Engineering and Computer Science from the University of California, Berkeley. During his Ph.D. research, he developed a new approach for formulating aircraft design as an optimization problem. He continued this research at Boeing’s Product Development and Applied Math sectors, where he developed optimization approaches to composite ply and test coupon layouts. As a result of his research, he has been able to apply the powerful solvers of geometric programming to achieve a highly efficient and scalable design optimization framework — and Boeing has dramatically shortened the amount of time needed for critical composite stress and material analysis proof-of-concept studies by rearranging material usage. Dr. Hoburg has received numerous many awards including the UCB Graduate Student Instructor Award, the NSF IGERT Fellowship, and the NSF Graduate Research Fellowship. This program is delivered via the edX online learning platform, and it’s designed to fit the schedules of busy professionals. Each course is available online 24 hours a day, seven days a week. Each course requires a time commitment of between four-and-five hours per week and is comprised of videos, readings, project-based works, and peer-to-peer collaborations. Guest lectures from industry experts from Boeing and NASA, US Air Force, General Electric, General Motors, Apple, MAN Truck and Bus AG. Robust collaborative environment to network and connect with other learners worldwide. Online platform: Learning takes place - when and where you would like - at your own pace (please note: Project-based work is the one item that requires a weekly submission). Our courseware works best with current versions of Google Chrome, Firefox, or Safari, or with Internet Explorer version 10 and above. For the best possible experience, we recommend switching to an up-to-date version of Chrome, Firefox, or Safari. When you complete all four online courses, you will earn a Professional Certificate in Architecture and Systems Engineering. This prestigious certificate signifies your knowledge and skill in complex systems and models. Grading: Letter grades are not awarded for this program. All four courses that comprise the program are pass/fail. In addition to the Professional Certificate, you will receive 8.5 CEUs when you complete this program. CEUs are a nationally recognized means of recording noncredit/non-degree study. They are accepted by many employers, licensing agencies, and professional associations as evidence of a learner's serious commitment to the development of a professional competence. CEUs are based on hours of instruction and may not be applied toward any MIT undergraduate or graduate level course. This program is well suited for engineers, system architects, directors, senior managers, and technical leads who want to optimize their operational, manufacturing, and design systems. While it is appropriate for professionals across a wide range of industries, it may be of particular interest to those in aerospace, automotive, defense, and manufacturing. The certificate is not limited to engineers or individuals in an engineering track. It is also relevant to project managers, supply chain buyers, manufacturing leads, product managers, and technical marketing professionals. Departmental teams are encouraged to enroll. Click on the Enroll Now button above. You may be prompted to first register for a MIT xPRO account if you do not have one already. Complete this process, then hit continue with the checkout process to pay for the program. After you complete your registration, you will receive a receipt and confirmation/instructions via email. How do I register a group of learners? Corporate rates available. To find out how this program can help your team, please contact Franklin Mathieu at fmathieu@mit.edu or 617-258-9747 or visit the Architecture and Systems Engineering Group Enrollment page. Individual registrations must be completed by February 18, 2019. For group sales, purchases can take place up until February 8, 2019. Please note that once registration has closed, no late registrations or cancellations will be granted. There are, however, a few exceptions: Unfortunately, US sanctions do not permit us to offer this course to learners in or ordinarily residing in Iran, Cuba, North Korea, and the Crimean region of Ukraine. MIT xPRO truly regrets that US sanctions prevent us from offering all of our courses to everyone, no matter where they live. Individual learners must complete registration and pay online with a valid credit card at the time of registration. MIT xPRO accepts globally recognized major credit or debit cards that have a Visa, MasterCard, Discover, American Express or Diner's Club logo. Invoices will not be generated for individuals, or for groups of fewer than 10 people. However, all learners will receive a payment receipt. Payment must be received in full; payment plans are not available. Cancellation requests must be submitted to MITxPRO@mit.edu. Cancellation requests received after February 18, 2019 will not be eligible for a refund. To submit your request, please include your full name and order number in your email request. Refunds will be credited to the credit card used when you registered and may take up to two billing cycles to process. Minimum Career Experience: 1-2 years of work experience in a technical field. Average Career Experience: 5-15 years of work experience. Past experience modeling, regardless of domain might be helpful. Some modeling types include for computation, physics-based simulation, testing or other. This experience will help ground you on the challenges and opportunities of modeling, but there are no required modeling languages nor experience. No management experience is required. However, some class materials will require learners to write about teamwork and general management topics as relevant to architecture and complex projects. Product Development Reference Models: Stage-Gate Reviews, Waterfall, Spiral, Agile. Requirements, including principles for developing clear and concise requirements, and requirements flow down and management tools. Identifying customer needs and voice of the customer analysis. Spreadsheet software (such as Excel) and simple spreadsheet models. Product lifecycle, including aftermarket and maintenance. Basic concept development methods (Morphological Matrix, QFD). The program starts February 11, 2019 and concludes on July 22, 2019. Each course in the program runs for four weeks (Course 1 is five weeks); there is a two week break between each course. Each course in the program requires a time commitment of between four and five hours per week, which is comprised of videos, readings, project-based works, and peer-to-peer collaborations. Program materials for each course will be available to registered and paid participants for 90 days after the conclusion of Course 4 of that program run. The course materials are not downloadable, but you are welcome to take your own notes. This course does not carry MIT credits. MIT xPRO offers non-credit/non-degree professional programs for a global audience. 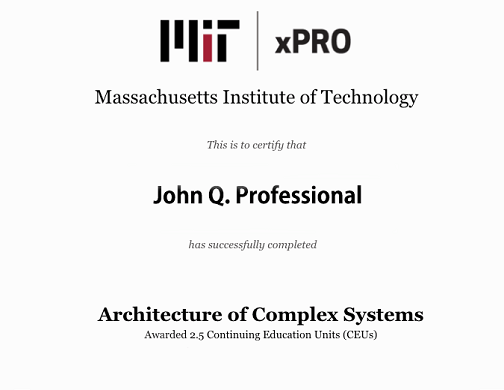 Learners may not imply or state in any manner, written or oral, that MIT or MIT xPRO is granting academic credit for enrollment in this professional course. None of our digital courses or programs award academic credit or degrees. Letter grades are not awarded for this program nor any of the courses within this program. Learners who successfully complete all course requirements are eligible to receive 8.5 Continuing Education Units (CEUs) from MIT. CEUs are a nationally recognized means of recording non-credit/non-degree study. They are accepted by many employers, licensing agencies, and professional associations as evidence of a learner's serious commitment to the development of a professional competence. CEUs are based on hours of instruction. For example: One CEU = 10 hours of instruction. CEUs may not be applied toward any MIT undergraduate or graduate level course. Prior to the first day of class, learners can take a demonstration course on edx.org that was built specifically to help students become more familiar with taking a course on the edX platform. Access our courses requires an Internet connection, as videos are only available via online streaming, and cannot be downloaded for offline viewing. Please take note of your company's restrictions for viewing content and/or firewall settings. Our courseware works best with current versions of Google Chrome, Firefox, or Safari, or with Internet Explorer version 10 and above. For the best possible experience, we recommend switching to an up-to-date version of Chrome, Firefox, or Safari.